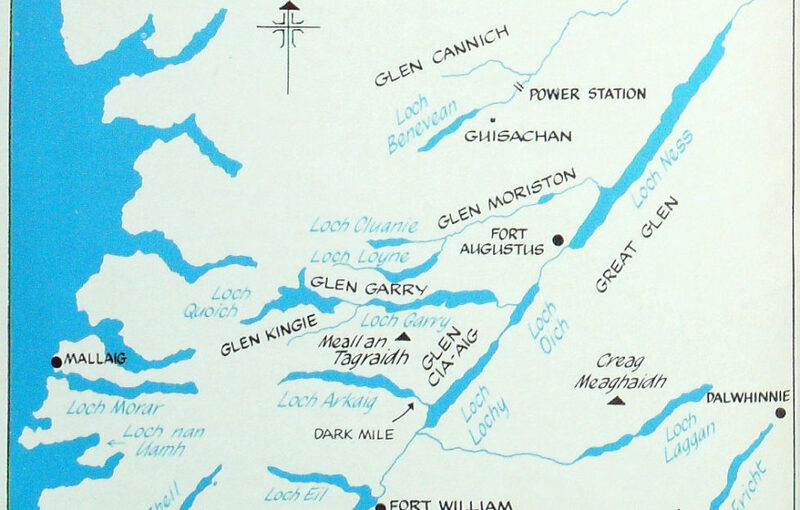 Part Four of Tom’s journey following Bonnie Prince Charlie’s trail at Glen Cannich, looking at some of the more puzzling aspects of those extraordinary months. Now for the incredibly bold part, considering the vigilance of the Royal Navy. The two ships carrying 500 men and 65 guns lay in the loch from the 6th to the 19th September. Of course, they didn’t advertise that they were French. They flew British colours. 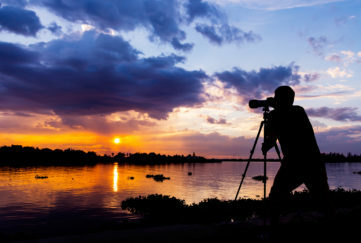 Contact with on-shore Jacobites was made. Credentials from France were carefully scrutinised and away went Major John MacDonald of Glenadale for Glenfinnan and over the hills to Loch Arkaig to locate the Prince. He drew a blank. Nobody knew anything. Then he met “a poor woman ” who divulged to the Major where Cameron of Clunes was skulking in a summer shieling. 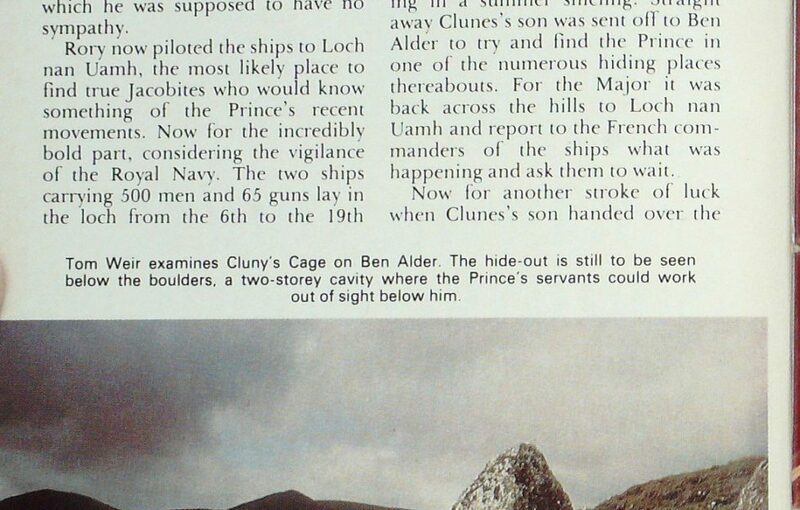 Straight away Clunes’s son was sent off to Ben Alder to try and find the Prince in one of the numerous hiding places thereabouts. For the Major it was back across the hills to Loch nan Uamh and report to the French commanders of the ships what was happening and ask them to wait. Now for another stroke of luck when Clunes’s son handed over the search for the Prince to one of Locheil’s tenants called John McColvain because he knew the ground, and the likely hideout. But McColvain didn’t know that the Prince had been moved, nor did he know anything at all about the secret Cage. 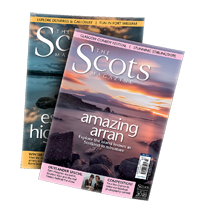 In fact he was en route to the wrong place, travelling in the darkness as fast as he could, when figures loomed up close, none other than Dr Cameron and Cluny MacPherson en route to Loch Arkaig, with some followers on a shadowy errand. 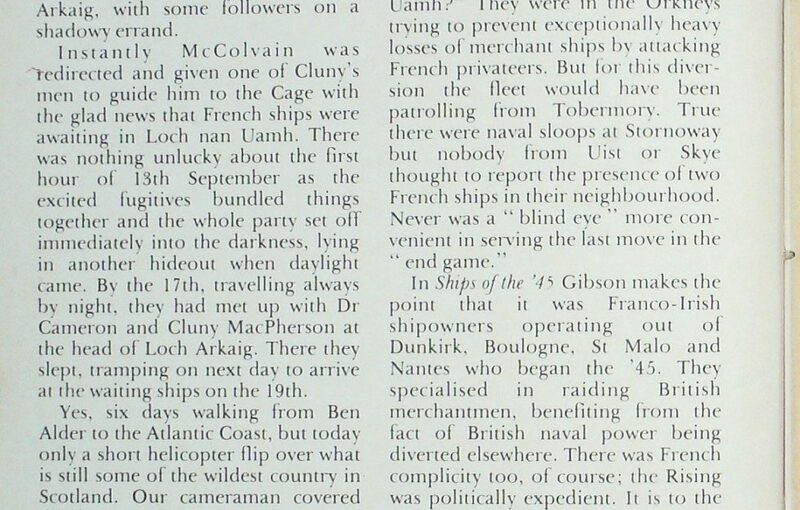 Instantly McColvain was redirected and given one of Cluny’s men to guide him to the Cage with the glad news that French ships were awaiting in Loch nan Uamh. There was nothing unlucky about the first hour of 13th September as the excited fugitives bundled things together and the whole party set off immediately into the darkness, lying in another hideout when daylight came. 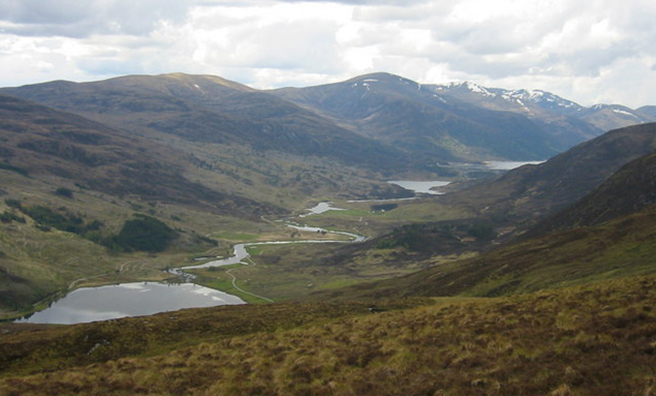 By the 17th, travelling always by night, they had met up with Dr Cameron and Cluny MacPherson at the head of Loch Arkaig. There they slept, tramping on next day to arrive at the waiting ships on the 19th. Yes, six days walking from Ben Alder to the Atlantic Coast, but today only a short helicopter flip over what is still some of the wildest country in Scotland. Our cameraman covered this by air to show the route, and I had the privilege of lifting off from Invermoriston and flying over the Corrieyairack and the head of Glen Roy, slanting over Creag Meaghaidh for Loch Ericht to pin-point the Cage below the rocky flank of the remote mountain. What a thrilling experience it was to hover like a bird, Hit through moving banks of cloud and gleams of sun, and look down the slit of the Great Glen as the golden eagle sees it. The bold officers of the L’Heureux and Prince de Conti must have been as overjoyed as the Prince that evening when, against all odds, they welcomed the Jacobite party aboard and could hoist sail in the early hours of next morning in a very fresh wind from the north, bending for Barrahead to round Ireland for France. They were in the Orkneys trying to prevent exceptionally heavy losses of merchant ships by attacking French privateers.